Try as I might I'm not always on time. But when I turn up to Cirrus ten minutes early I feel slightly elated that I am for once early. But then who do I spot sitting outside Cirrus than my friend the perpetually early and on time Ute. I may be early but I don't think I'll ever arrive somewhere before her. 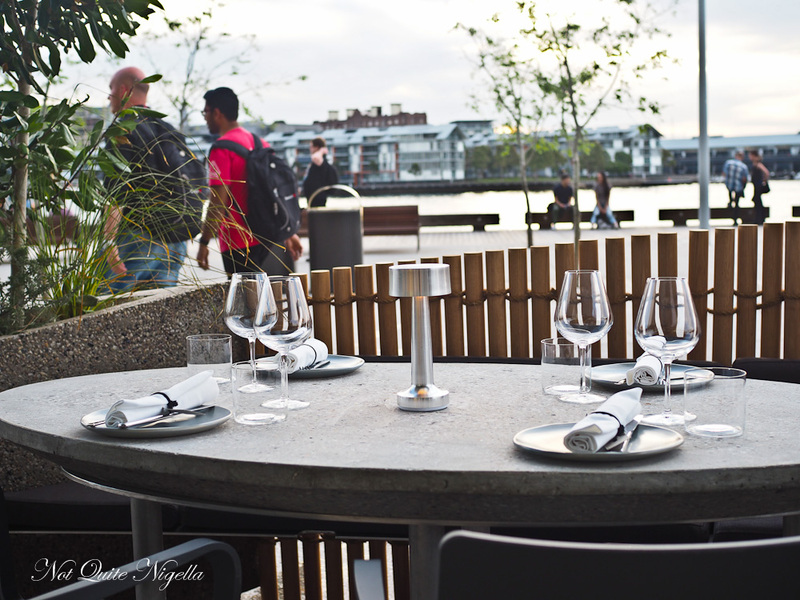 Cirrus, located at the site of the recent Noma Sydney pop up is quite a different space. There are wooden rods in the window but on a balmy Summer's evening the spot to be is outside. Once the many cranes disappear there will be a waterview. 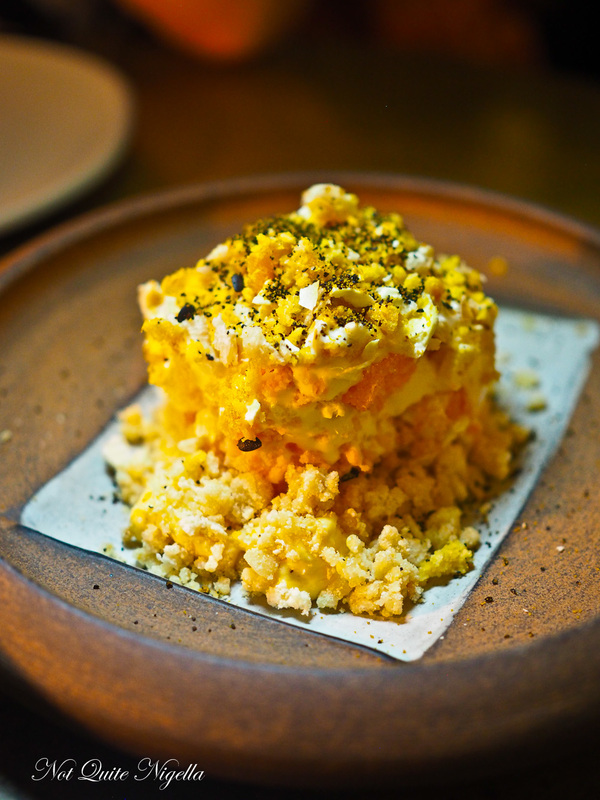 And Noma has left a legacy behind with the use of native Australian ingredients from paperbark, wattle and lots of sustainable fish and seafood (although the latter isn't new). 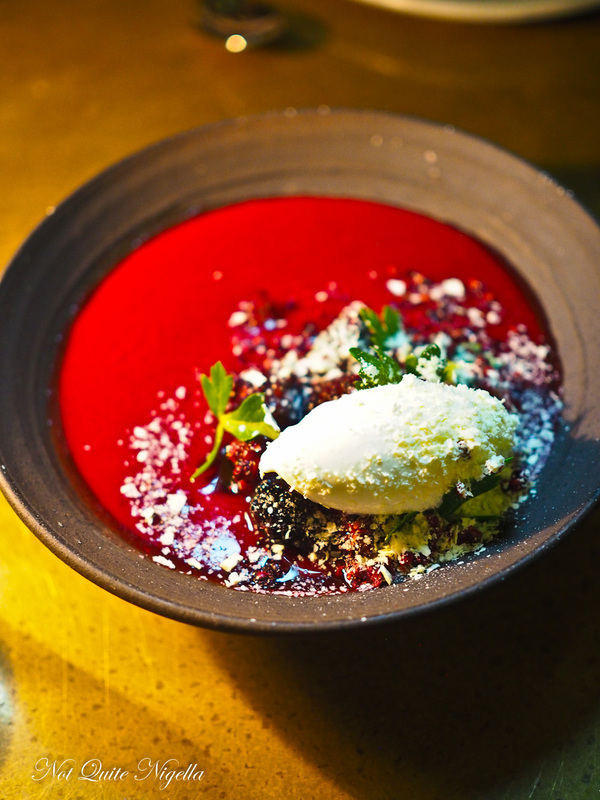 Cirrus is the newest restaurant by chef Brent Savage and Sommelier Nick Hildebrandt from Bentley Bar and Yellow. The menu features mostly seafood with sections for crustaceans, fish, oysters & caviar to a small land section too in case meat eaters feel neglected. But for us tonight we are trying mostly seafood items. 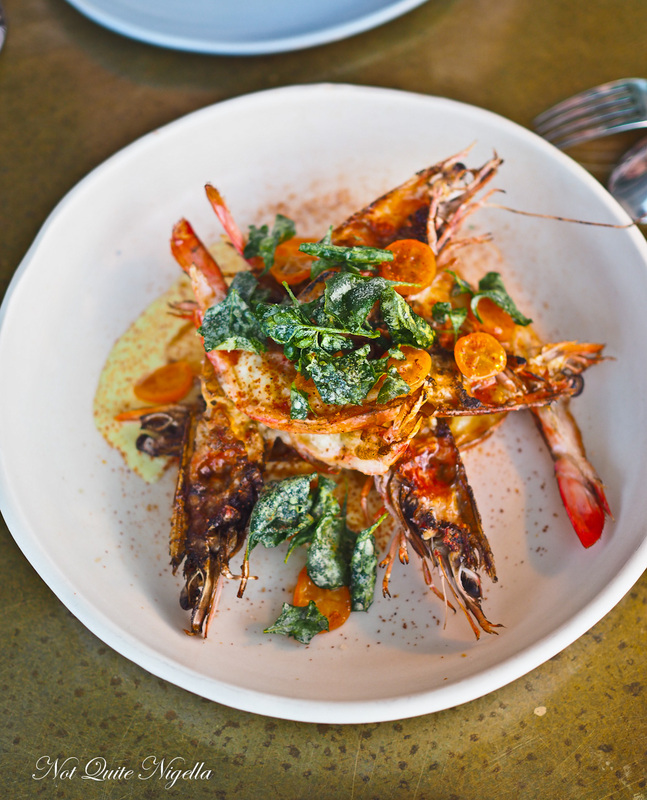 We start with the roasted tiger prawns, split horizontally and roasted with a creamy fenugreek milk and fried saltbush. 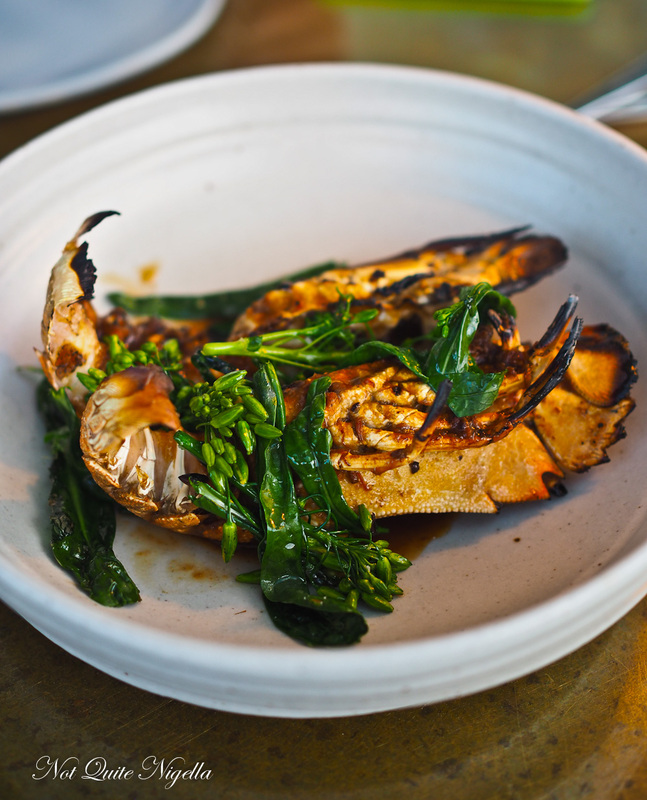 We both like this dish particularly the fenugreek milk that give the prawns a subtle lift. The Moreton Bay bug is really a bug singular cut in half. It's paired with greens and a house made XO sauce that isn't quite similar to traditional Chinese XOs but still good. The meat is tender but it's pricey for the small amount of meat fished from the shell. "That fish is looking right at me," Ute says slightly perturbed. "It doesn't look very happy," she adds. 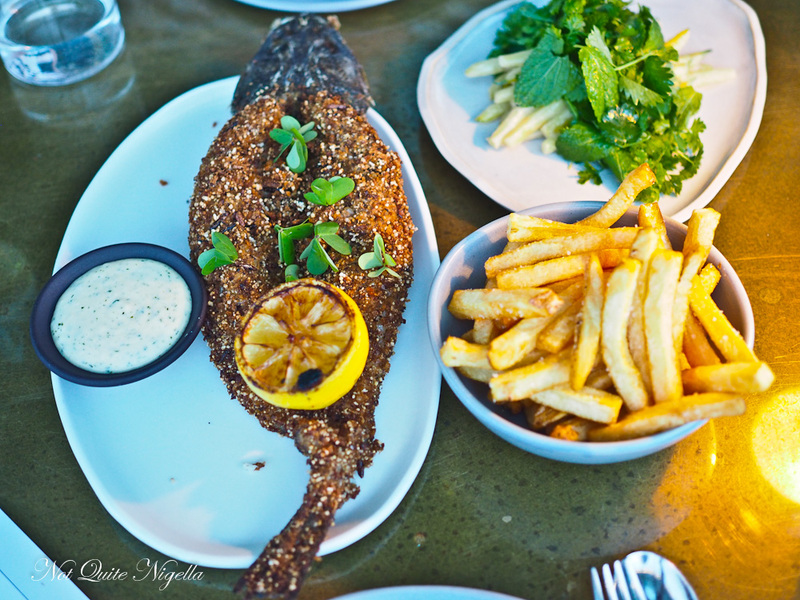 The flathead is coated in a mix of quinoa and seeds and deep fried whole. The spine has been removed for easy eating and it comes with a bowl of chips and a tartare sauce. This is not traditional fish and chips. It's crunchy and the flathead is always such a moist texture fish when cooked right. The yellow beans are tangy and it's good to see that they still have a bit of bite to them. 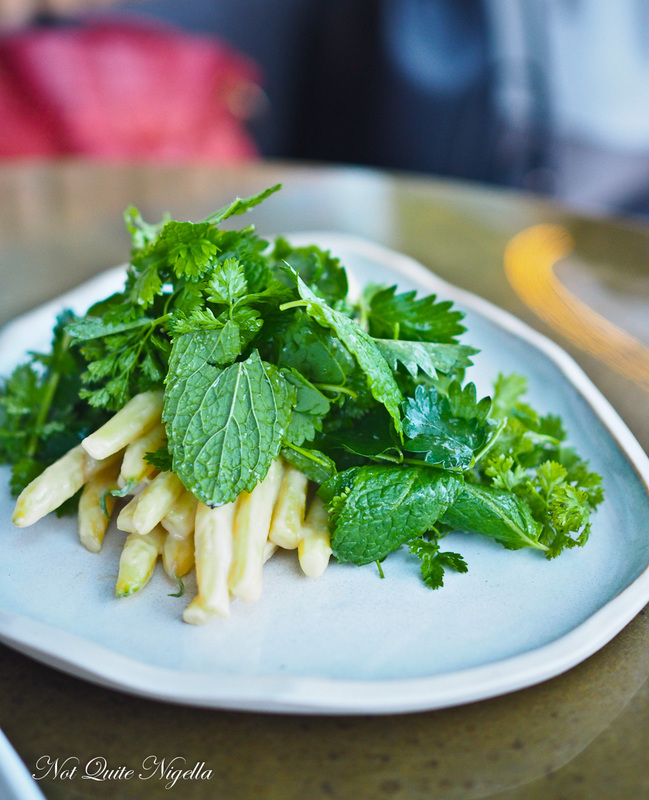 They're dressed in a creamy dressing with a salad burnet on top and fresh mint. They make for a good contrast to the deep fried fish. There's a bit of commotion at the table next to us as they receive their lobster. Cameras come out and people crane their neck as if a celebrity had just walked in. Once the restaurant swells to full, service does become quite absent and our waiter who is fine but not brilliant disappears as he is torn in many directions. We have to flag someone down after much searching to order dessert. The magnolia ice cream has an intriguing floralness to it. There are passionfruit comb pieces and almond meringue and a sprinkling of freeze dried fruit (lychee, pineapple and mandarin). Our waiter tells us that the Vermouth custard is the dessert that divides many. Ute and I both taste a bit of beer maltiness in this and while it is visually arresting, each mouthful that you take of this dessert tastes different. I loved my first bite of this dessert and spent the next 5 spoonfuls trying to get that same flavour again to no avail. So tell me Dear Reader, are you always the first to arrive or last? 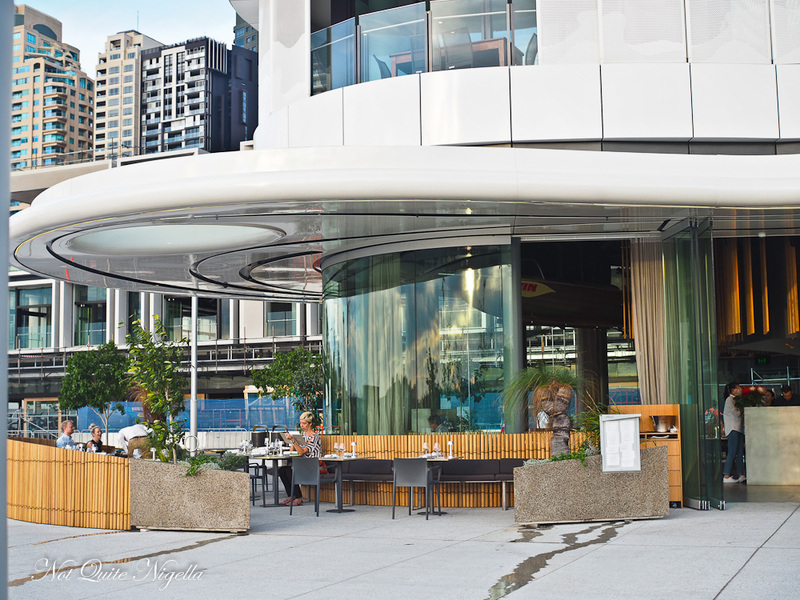 And have you visited Barangaroo yet? What do you think of the new development?